Reviewed! 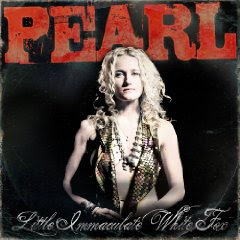 Pearl Aday - "Little Immaculate White Fox"
Pearl’s bio states – “Solve this riddle: raised on Meatloaf, cultivated by Motley Crue, exposed to Anthrax and shot out by a Velvet Revolver: this Pearl is a rare find. Clever, yes, but really Pearl, really? Sure, she has a great rock lineage – Meatloaf is her step-father & she’s engaged to her guitarist who happens to be Scott Ian, but with her debut record “Little Immaculate White Fox,” Pearl is blazing a new path, one all her own. She isn’t exactly alone though, as she enlists the help of Mother Superior (the Rollins Band) on this record. On the whole, “Little Immaculate White Fox” is exactly what you’d expect given the parties involved; hard-hitting rock infused with a touch of grit and a lot of attitude, but things mostly come across as bland. It’s not all bad however; there are some quality moments (‘Mama, My Heart Isn’t In It’), although they seem like islands in the grand scheme of things. The music is very solid throughout, especially the guitars, but the songwriting is less than stellar. At times the songs are too insistent upon themselves, as if Pearl is going out of her way to make sure you know she’s a female rock singer. It’s not completely convoluted, just a bit much at times. Honestly though, if you want to hear some nice guitar riffs that never quit, go ahead & give this record a shot. But keep in mind you’re getting everything else that comes along with those tasty licks.